When Roosevelt Smith III twirled, do-si-doed and promenaded across the dance floor at AMVETS Post 9 in Schnitzelburg, it was not such an unusual sight in a building that houses regular community dance nights. But for Smith, 48, the evening was significant. 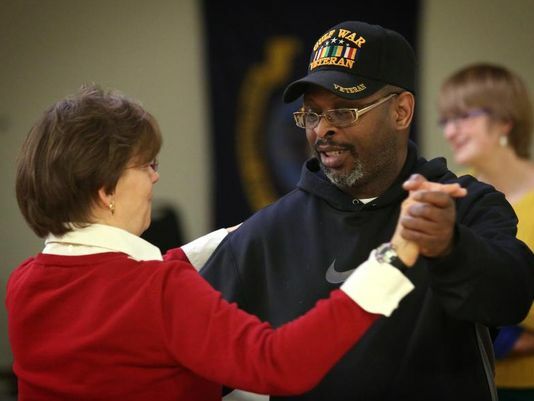 Smith takes part in a twice-weekly dance group for veterans with post-traumatic stress disorder and traumatic brain injury. Smiling beneath his Gulf War Veteran hat, Smith took evident pleasure in the dance. But according to Smith’s wife, Jennell, he has struggled to enjoy himself since leaving the military in the early 2000s. The dance series, called Dancing Well: The Soldier Project, has been meeting at the AmVets post twice a week since the beginning of February. Although its last two meetings are this week, organizer Deborah Denenfeld encourages new participants to come try it out. So far, the response from participants has been overwhelmingly positive, Denenfeld said. She said she heard from one veteran who used to think regularly about suicide, but now looks forward to coming out to dance. Denenfeld started calling dances for veterans with PTSD and traumatic brain injury at the VA Healthcare Center in Fort Knox when a staff psychiatrist, Edwin Walker, came up with the idea. The Department of Defense considers traumatic brain injury one of the “signature injuries” of the wars in Iraq and Afghanistan, due to the high number of soldiers returning from the battlefield having sustained head injuries from improvised explosive devices. It can affect things like memory and emotions, and increase the risk of Parkinson’s and Alzheimer’s disease. Walker, a fan of a highly organized dance form called contra dance, thought the combination of hearing music and learning the steps might help other vets. He connected with Denenfeld, who has years of experience as a dance caller, and asked her to come to Fort Knox. A dozen veterans and their spouses or partners participated in the 10-session program at Fort Knox. Walker was impressed with the results. “They came to notice that their pain was less, their anxiety was less, and their memory improved a little bit,” he said. One family brought its teenage daughter to the sessions. “The daughter looked me in the eye and thanked me for giving her her daddy back,” Walker said. After the series, Walker moved to North Carolina, and Fort Knox didn’t continue the program. But the experience inspired Denenfeld to begin her own program for veterans. “Deborah has kept on like a bulldog on a bone on this thing and done a marvelous job,” Walker said. For the past two years, she has been raising money to put together Dancing Well: The Soldier Project. Denenfeld plans to hold at least one more series of 10 dance nights in Louisville before taking the project to other cities. Eventually, she hopes to develop a curriculum and train other dance leaders to bring the program to a national audience. Before the current series began, she interviewed potential participants to make sure they were a good fit for the program. Some, she said, had more acute issues than dancing could help with. Denenfeld recruited volunteers from the local contra and square dance community to provide dance partners for the veterans. One volunteer, Mara Thomas, 25, also helped connect Denenfeld with significant funding to get the project off the ground. When: Tonight and Thursday, 6 to 7:30 p.m.
Where: AMVETS Post 9, 1567 S. Shelby St.